Purchance is a website that offers you a chance to win a purchase when you shopping online with some online stores. It is interesting idea. You can register an account, and pick a partner store that on list you want shopping on. 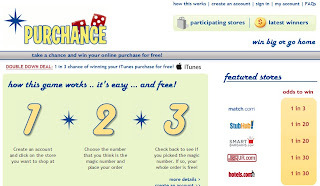 When you shopping you can also pick a magic number, that number will in random number generator of Purchance. Like a lottery game, if you lucky you can win a free purchase, that means this purchase is free for you. You can see the odds for each store. Good lucky if you want try.